Chris Lockwood has taken the Cervantes Speed Trials 2012. 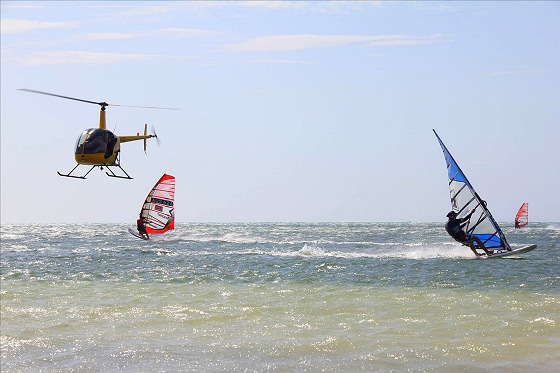 The speed windsurfing event is held 200 kilometers north of Perth. The small fishing town of Cervantes is known for its windy conditions and excellent tracks for speed windsurfing. In two days of ocean races and general free sailing, there were great records being registered by the GPS devices. Up to 17 windsurfers have accelerated at, at least, 60 km/h (32.3 knots). Chris Lockwood was the fastest wind rider by registering a speed of 71 km/h (38.3 knots). Actually, Lockwood was the only clocking in the 70 km/h range. On the first day, the Cervantes Speed Trials 2012 saw 35 knots blowing in the regatta field. On the second day, winds were lighter in the 15-20 knot range. Sailors reported speed differences between the GPS devices and the radar gun. That can be explained by the direction to where the radar was aimed, which is not always registering the fastest speed of each windsurfer.